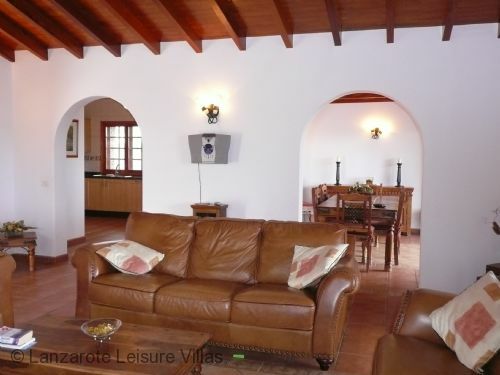 Casa Cielo is a superb four bedroom villa surrounded by high walls giving privacy in all areas. 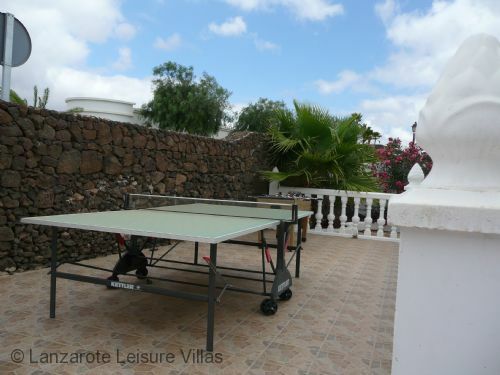 A drive with electronic gates or the pedestrian entrance lead you past the outdoor games area with table tennis table to the front door. Upon entering Cielo, off the hallway to the left are all the bedrooms whilst to the right up a few steps is the large lounge with four comfortable leather sofas. 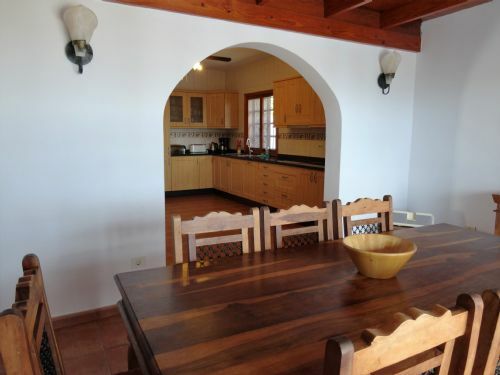 There is an archway through to the dining room and another archway leading to the large, modern, fully-fitted kitchen and separate utility room. The bedrooms all lead off the main hallway. There are two twin bedrooms, with 2 single beds in each, a family bathroom, a master bedroom with a king-sized bed and ensuite bathroom with walk-in shower and bath, and a further bedroom with double bed and en-suite. The spacious lounge and dining room both have doors out to the covered, sea view terrace which overlooks the very large 10m x 6m swimming pool with waterfall feature and corner roman steps. 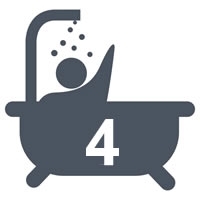 This pool has been changed to a salt chlorinator so no more chemicals in the pool. The upper terrace is equipped with modern comfortable furniture for relaxing as well as table and chairs, barbecue and outdoor fridge for al-fresco dining. 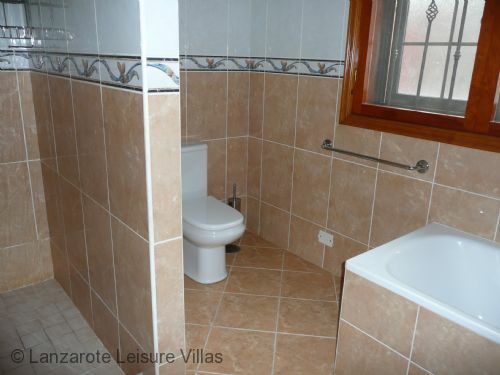 There is also a shower room and separate toilet off this terrace, which is useful when you are by the pool or as the fourth bathroom. On the lower level around the pool there are sunbeds, an umbrella and a further table with chairs. The recent addition of free WiFi is good for keeping in touch with home or work. 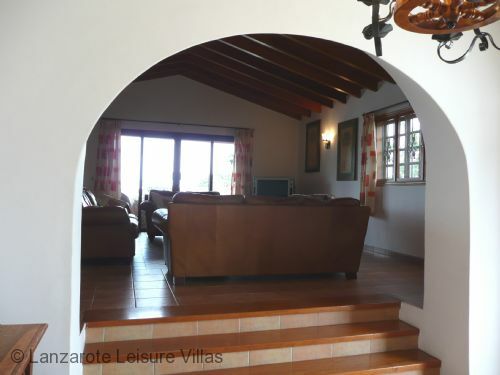 The quality and size of this villa will appeal to families but will also suit couples who like a spacious villa in which to relax. 3 generations stayed here for 2 weeks, ranging from 4 to 54, and we all loved it. 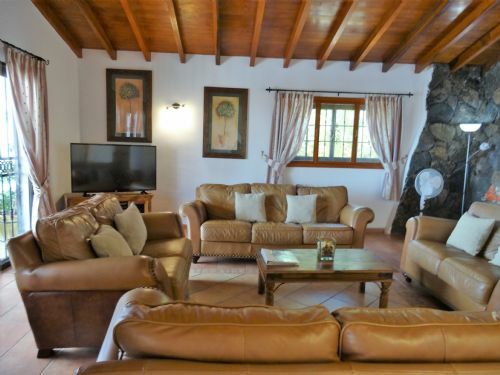 The villa is huge - the pictures don't really do it justice - and very nicely equipped. The bedrooms are roomy (the master is enormous) and the bathrooms are all large, with good showers (note they are pressure fed, so they can be effected by the dishwasher etc) and crucially for us there was a bath in the main bathroom for little ones. 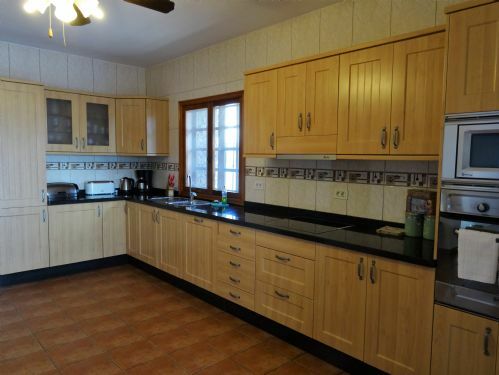 The kitchen is showing signs of wear & tear, but is large, well laid-out and well equipped. I'd say take a knife sharpener, but other than that it had everything we needed, and we catered quite a bit. Outside, the BBQ is brilliant - large and easy to use - and the outside fridge made life a lot easier for soda & chocolate runs. Likewise an outside loo, which stopped slippy trips to go inside when wet. The pool is 10x4 metres, so quite large, and it has steps in for little people but is 1.4m in the shallow end, but no slope/shallow end, though we didn't find that a problem. The cover is easy to pull on & off, and I recommend using it nightly as it's solar and makes the pool lovely and warm. Our only criticism of the outside space - the covered seating & dining areas are excellent - is that there is no shade for 'shade bathing'. We ended up buying umbrellas, but it's breezy so not ideal as both broke within days We think they should put up sails in 1 corner; the management company said the shaded balcony would do the trick but really it's not geared up for taking beds up there & would be too 'away' from the other beds. Finally, the position is perfect; far enough away to be quiet at night, but only 10 mins walk (with toddler) downhill to the pretty harbour, with many good restaurants. We didn't like the 'new town' other than for lilo shops, but it will appeal to those who like lively nights, and is only a 15 min walk. Great villa. Easy walking distance to the old harbour (all downhill tho so all uphill return) Also very close to Lidl for supplies. 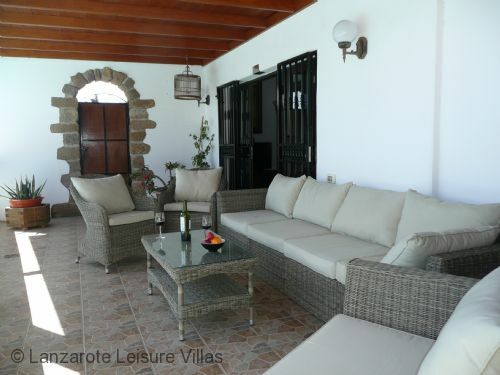 This is an excellent villa and our party of four adults thoroughly enjoyed our one week stay here. 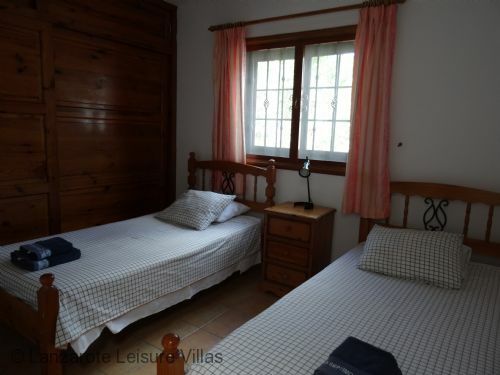 Well furnished and equipped and unoverlooked, the villa is spacious and benefits from a lovely heated swimming pool. Lots of storage space in the bedrooms, comfortable beds and a large, covered terrace together with plenty of room for sunbeds in the open. Room enough to park two vehicles in the grounds behind the remote-control operated gate, and very secure all round, including a strongbox in one of the bedrooms. It's an easy five minute stroll down the hill to the nearest supermarket, and ten more minutes of strolling in a slightly different direction takes you into the heart of the old town. If you want to cab it back it won't cost more than four euros including a decent tip. The area it's in is very quiet and restful. We also thought it represented outstanding value for money. Wi-Fi cover was speedy and covered nearly all of the site, which is extensive. We found that both Erika and Emma were quick to come back to us to resolve the few queries we had while we were there. 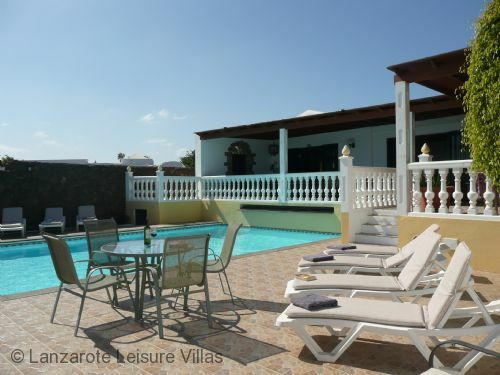 We would definitely book Septimo Cielo again for a family/friends villa holiday in Puerto del Carmen. 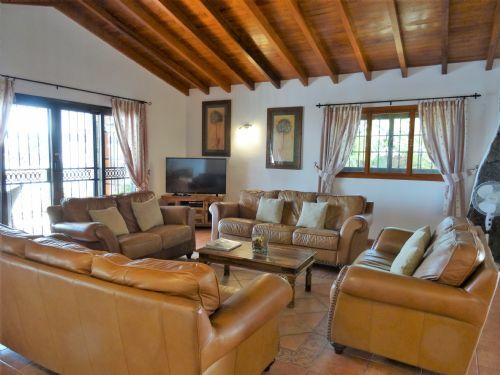 I have posted my review on Home Away and just wanted to say we had a wonderful time in Casa Cielo. Erica was very good from our first welcome until we left. 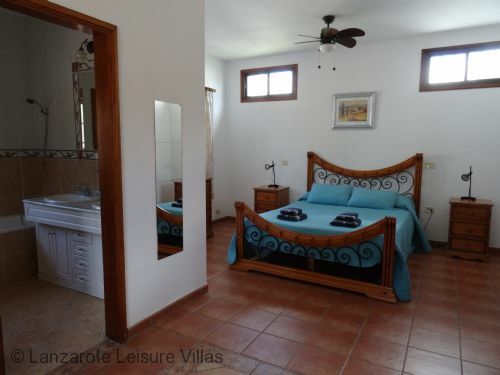 The villa is absolutely beautiful and very well equipped. We were concerned about not having air conditioning but it wasn't needed as the breeze coming through the villa kept it cool. 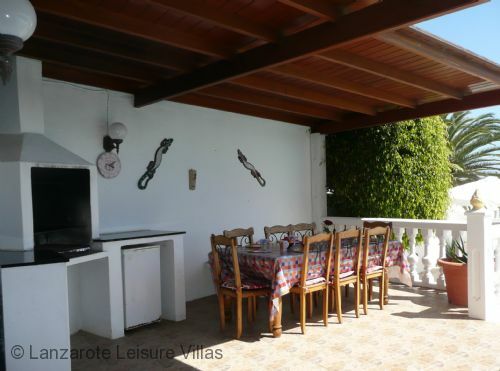 The location was just what we wanted quiet but within short walking distance of shops, beaches and restaurants. Our first time in Lanzarote and we were very impressed. We look forward to booking with you again. 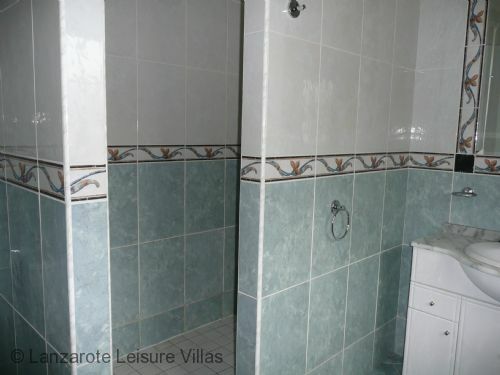 We were very pleased with the quality of the accommodation which was very spacious and well equipped. We particularly liked the internet TV which provided welcome entertainment when wanting to keep out of the sun. 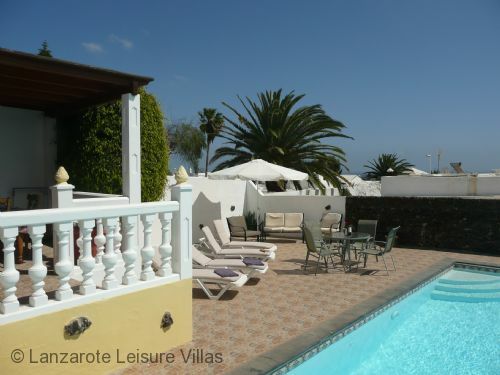 The pool area was very spacious and well equipped and the sheltered patio area very popular. 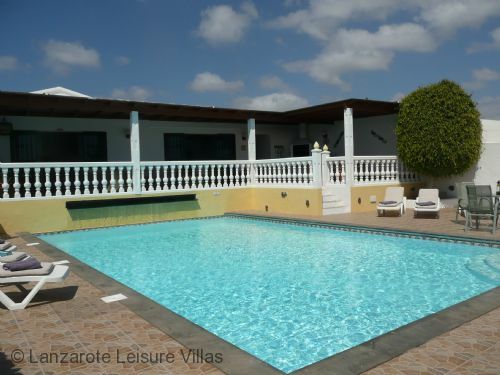 We appreciated the regular visits from local staff and would definitely consider another holiday with Lanzarote Leisure Villas. A wonderful holiday. Just what we needed. A beautiful home from home. Thank you so much, the Donaldson clan. Thank you! Beautiful villa and pool. So comfortable and spacious and an ideal spot with a sea view too! Thank you to Erika and her team for all their consideration. 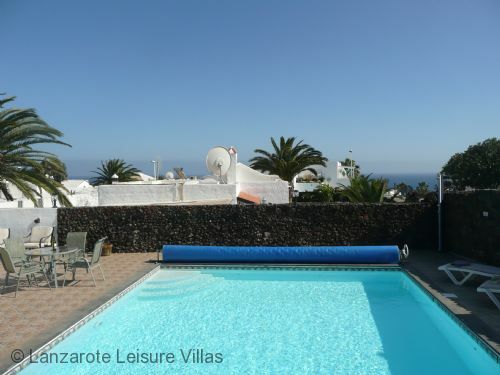 The villa is in a residential part of Puerto del Carmen’s Old Town known as Los Mojones. This is a quiet part of town yet close to all the amenities. Supermarket: 6-7 minute walk (500m) east to No. 1, Calle Juan Carlos I. A large well-stocked supermarket with a great meat counter for your BBQ. When paying just ask a staff member to call a taxi for you and they will happily do so. Local restaurants/ bars: 5-6 minute walk (500m) south-east to Calle Juan Carlos I. Shopping: Biosfera Shopping Plaza, 8-10 minute walk (550m) south to Calle Juan Carlos I. Four floors of shops, restaurants and amusements including Starlight Open Air cinema playing 2 English movies each evening, a billiard and pool hall, crazy golf, and Cine6D virtual reality motion rides. Harbour: 14-16 minute walk (900m) south-west to a wide choice of restaurants and bars in the harbour area. Great for lunch, dinner or a drink while an adventure playground keeps the children amused. Lots of choice of boat trips from the harbour including trips on a submarine, scuba diving and the Water Taxi to the marina at Puerto Calero. Beaches: both are a 16-20 minute walk (1.1km). Playa Chica is a pretty little cove surrounding by volcanic rocks, which is perfect for snorkelling and diving (a dive school is located here). Other sports enjoyed at Playa Chica are parascending, banana boat rides, single and double jet-skiing, Crazy UFO and Fly-boarding. The main beach, Playa Grande, has fine grain sand for nearly 1.2km long with calm waters, a very gentle shelf and little current so paddling and swimming are very safe. Main Beach Road: 16-20 minute walk (1.1km) to the western end of Avenida de las Playas, the long 'strip' of restaurants, cafes, bars and shops of the greatest variety that runs parallel to Playa Grande. Beach-side, the palm-tree lined promenade is perfect for strolling, jogging, cycling on the red brick cycling lane (many bicycle renting places available), or just people watching. Don’t forget taxi fares are inexpensive in Lanzarote if you don’t want to walk home. 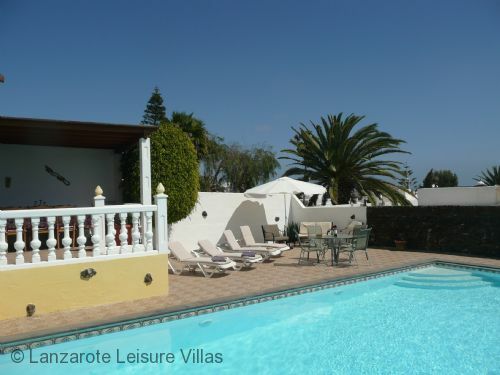 Golf: Lanzarote Golf - an 18-hole public course, 5 minute drive (2.7km). Zoo: Rancho Texas Lanzarote Park, a 4 minute drive (3.1km). Displays of birds of prey, sea lions, and parrots and cockatoos and you can also see other exotic birds and reptiles, including the Komodo dragon. Also a cowboy lasso and whip show, and the children can enjoy canoeing and gold-panning, pony riding, and then cool off in the pool. Go Karting: Gran Karting, a go-karting track 11 minutes drive north-east (8.3km). National Park: Timanfaya National Park, the natural wonder of Lanzarote has a unique 'Martian' landscape and rare plant species. To the El Diablo restaurant, a 32 minute drive (24km). A unique experience is it to take a camel ride across the volanic landscape (21 minute drive, 19km). Water Park: Aqualava Water Park, a geothermally-heated water park, 30 minutes drive south-west (25km). Markets: every Friday 10am - 4pm 100 stalls set up at the Plaza Varadero near the Old Town harbour for locally sourced fruit, vegetables and flowers, as well as handmade craft items, jewellery and clothes (900m). At nearby Tias, the Saturday morning 9am - 2pm Farmers market is an ideal place to purchase fresh locally produced vegetables much cheaper than the supermarkets (8 minute drive 6km north-east). Also, the biggest open-air street market in Lanzarote is on Sunday mornings 9am - 2pm in Teguise (28 minute drive 21km north-east). Pool has a cover and steps for entry. Cover should be kept on when the pool is not being used for long periods. Using the pool cover overnight is essential as the water temperature can drop as much as 6C degrees. 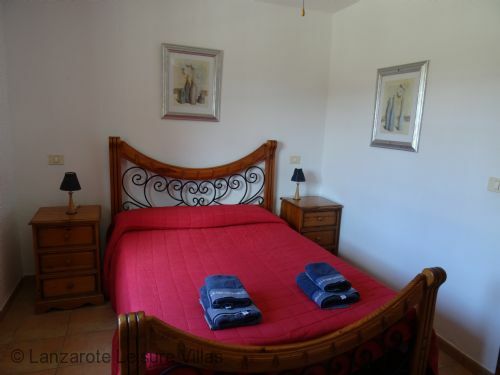 Stays of 11 - 14 nights - the villa will have a full clean and fresh bed linen. Staying for 10 nights or less and want extra cleaning and bed linen? Contact us for a quote. Dishwasher, washing machine, fridge/freezer, oven/hob, microwave, toaster, coffee machine. Safe, hairdryer, iron and board. Welcome food pack of tea, coffee, sugar, juice, water and milk. If you would like anything additional upon arrival, please request.